Despite the recent rapprochement between Turkey and Russia, the two countries are still rivals in the Black Sea and South Caucasus, according to an International the Crisis Group report. Relations between the two countries nearly collapsed after Turkish fighter jets shot down a Russian SU-24 warplane near the Syria-Turkey border in late 2015. 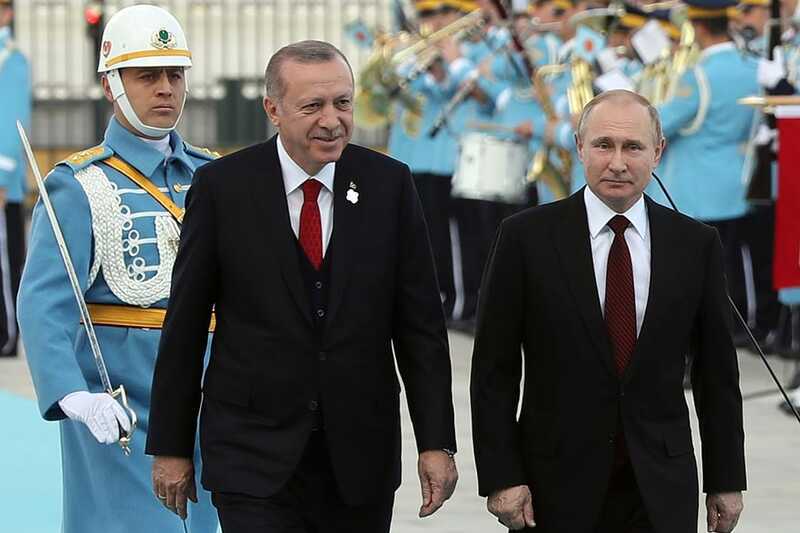 But since Turkish President Recep Tayyip Erdoğan publicly apologised for the incident and Russian President Vladimir Putin’s support for Turkey during the July 2016 coup attempt, the two countries have worked on mending ties. The economic interests of the two countries created incentives to seek an end to Russian sanctions, while political interests of both paved the way for cooperation in Syria. The Turkish government’s policy of containing the Kurdish militia in Syria, which Turkey sees as a branch of the Kurdistan Workers’ Party (PKK), an armed group which has been fighting inside Turkey since 1984, has strained its relations with the United States, which has backed Syrian Kurdish forces battling Islamic State. Along with Iran, Russia and Turkey launched the Astana process in 2017, a mechanism to find a diplomatic solution to the war in Syria, which they say is complementary to the United Nation’s Geneva peace talks. Turkey’s decision to purchase Russian S-400 missile defence system has also raised concerns among its NATO allies, which say this move could threaten the interoperability of the alliance’s integrated defence systems. Russia and Turkey also cooperate in energy policies and Turkey’s first nuclear plant is being constructed in a joint Russian-Turkish project with Russian energy company Rosatom the majority stakeholder. "Russia-Turkey rapprochement has reached such peaks as to prompt Western concern about Turkey’s commitment to NATO and what some officials perceive as Ankara’s pivot east,” the International Crisis Group report said. But, the report notes, though such concerns are not groundless, they overlook the continuing rivalry between Ankara and Moscow in the Black Sea and South Caucasus. In the Black Sea, Russia’s annexation of Crimea in 2014 shifted the strategic balance in the region in its favour and increased Turkey’s concerns about Crimean Tatars and in return forced Turkey to reverse its decades old policy of keeping NATO out of the region. In the South Caucasus, Russia and Turkey are on the opposite sides of the conflict between Armenia and Azerbaijan over the disputed region of Nagorno-Karabakh. The report said the competition between Russia and Turkey in South Caucasus also adds to the region’s militarisation. “At the same time, Moscow’s expanded military footprint in Syria, Armenia, Georgia’s breakaway regions of Abkhazia and South Ossetia, and on the Crimean peninsula fuels Turkish fears of encirclement,” it said. Though the two countries have conflicting objectives, their rapprochement might create an opportunity to prevent flare-ups in those two regions, the report said, with Ankara using its ties to both NATO and Russia to mitigate the risk of incidents in the Black Sea, two countries cooperating in maintaining peace between Armenia and Azerbaijan, and Turkey using its ties with Moscow to protect the status and the rights of Crimean Tatars. Russia and Turkey: Back to Normal? Every time President Vladimir Putin and President Recep Tayyip Erdoğan meet, they boldly declare the problems between Russia and Turkey are dead and buried. Their latest tête-à-tête this week was no exception. "I want to note at the beginning of our meeting that our relations can be considered practically completely restored," Putin said in the southern Russian city of Sochi on Monday. In reality, cracks are reappearing. Sure enough, Moscow and Ankara may no longer be at loggerheads as they were in the tense months after Turkey shot down a Russian warplane over the Syrian border in November 2015. Economic ties have resumed and grand energy projects taken out of the freezer. Putin and Erdoğan have busied themselves horse-trading over Syria. But that is just the veneer masking a number of disagreements and outright conflicts. Let us start with Syria, ostensibly the main subject of the Sochi talks. At a joint press conference, Putin and Erdoğan stuck to general comments to the effect that a political resolution to the conflict is in sight and that Russia and Turkey are coordinating efforts to stem the violence. Nothing concrete, in other words. It is not that Turkey and Russia are working at cross-purposes. At the end of the day, Erdoğan sees cooperation with the Russians as a guarantee that he will have a say in the future of the neighbouring country, which has become central to Turkey’s own security. Operation Euphrates Shield, a Turkish cross-border military intervention, was launched in August 2016 with Russia’s tacit endorsement. Russian air strikes also helped Turkish forces and their allies from the Free Syrian Army evict Islamic State from the strategic city of al-Bab in January of this year. Ankara, for its part, facilitated the handover of the besieged eastern side of the besieged city of Aleppo to Syrian government forces. Having co-sponsored the peace talks in Astana, Russia and Turkey are now collaborating in setting up a de-escalation zone in and around the northwestern city of Idlib, controlled by a Syrian offshoot of al Qaeda. But here is where Russia and Turkey part ways. Ankara sees the Idlib operation as a stepping stone to taking over neighbouring Afrin, a fortified enclave controlled by the YPG, a Syrian Kurdish militia linked to the Turkish Kurdish armed separatist Kurdistan Workers Party (PKK). Moscow, by contrast, is reluctant to give carte blanche to the Turks. It treats the YPG and its political wing, the Democratic Union Party (PYD) as a partner, not as a threat. The self-proclaimed, mainly Kurdish autonomous region of Rojava maintains a representative office in Moscow. Russian authorities have also not blacklisted the PKK as a terrorist group, unlike the United States and the European Union. In January, the Turkish government was taken aback when the Russians submitted a constitutional draft to the Syrian peace talks in Astana that included self-rule for the Kurds. Russian military personnel also deployed in Afrin in late August. Moscow considered inviting the PYD to a gathering of Syrian opposition groups, again in Sochi, on Nov.18. The conference has now been postponed, but the frictions between Russia and Turkey concerning the Syrian Kurds have not gone away. This is the reason Erdoğan is growing more and more frustrated. The bid to trade Idlib for Afrin did not quite work out. Nor is Russia is budging at Turkish threats to take unilateral action against the YPG-held enclave. There is the sense that Turkey is undercut because of Moscow’s overtures to Washington, which happens to be the Syrian Kurds’ principal ally. The brief encounter between Putin and U.S. President Donald Trump at a summit in Vietnam yielded local ceasefire deals in southwest Syria. The area is far from Turkey’s border but a renewed push from both Russia and the United States for political settlement in Syria may have far-reaching consequences, for example consolidating YPG control over large stretches of the 900-km border with Turkey and oil-rich parts of eastern Syria. That is why, in the run-up to the Sochi meeting, Erdoğan chose to talk tough not only against the United States (hardly surprising given the chill in bilateral relations), but also against Russia. “If a military solution is out of the question, then those who say this should pull their troops out,” he said in a thinly veiled reference to the Russian and U.S. presence in Syria. Yet engagement is his only viable option. A new summit is coming up on November 22, again in Sochi, with Iran’s President Hasan Rouhani attending as well. Something is brewing indeed. Remarkably, Putin and Erdoğan bypassed the much-discussed sale of Russian S-400 surface-to-air missiles to Turkey. The deal has prompted speculations that Ankara is about to “pivot” away from NATO and align its defence policy with Moscow. However, Turkish Defence Minister Nurettin Canikli this week confirmed parallel talks with the French-Italian consortium EURASAM were moving forward. Canikli also said the S-400 was “a done deal”. Whether the Russian missiles will ultimately come to Turkey will depend on how much Ankara is willing to tone down its demand for joint production and technology transfer. From what it seems, it is giving ground to the Russians who are not thrilled about that condition to the sale. Stumbling blocks stand in the way of reenergising economic ties. Russian authorities have been slow to lift restrictions on Turkish agricultural imports. The reasons are many; from Moscow’s habit of using trade as political leverage, to vested interests in the Russian Federation seeking to close doors to foreign competition. Russian Agricultural Minister Aleksandr Tkachov and his family have extensive business interests in the sector. Russia is to finally allow Turkish tomatoes to its market towards the end of this year, Deputy Prime Minister Arkady Dvorkovich recently said, but will still be subject to a quota. Turkish attempts to strike back with restrictions on imports on Russian wheat and corn have failed to make an impact. Moscow is furthermore unwilling to reinstate the visa-free regime for Turkish citizens, in place since the jet crisis of 2015-6. That is a real pain in the neck for Turkey’s construction businesses that used to make billions of dollars on the Russian market, helping to alleviate the structural deficit that has bedevilled bilateral trade relations since the 1990s. Energy is the only field where Russia and Turkey can report major progress. In Sochi, Erdoğan invited Putin to attend the official launch of construction of the Akkuyu Nuclear Power Plant. When that will happen is not clear. Do not forget though that one of the consequences of the breakdown in relations is the softening of Turkish bargaining position. Eager to restore ties, the government in Ankara acceded to demands to give Russian state-owned company Rosatom, in charge of the mega project, tax breaks to the tune of $3 billion. Akkuyu was finally granted a license. Turkey has furthermore agreed to shoulder part of the financial cost. In June, Rosatom sold 49 percent of the venture to the Cengiz-Kolin-Kalyon consortium for an undisclosed sum. For the Russians, Akkuyu is a priority as it showcases its technology to other customers in the Middle East and further afield. But Rosatom’s delivery record is far from impressive. It is no exaggeration to say that Russian-Turkish relations have returned to normal. But what counts as “normal” is the same old mix of cooperation and rivalry we have known ever since the time before Erdoğan and Putin were in charge. These two are no longer enemies, but they have not become friends either.